This is a great cause and a great organization – I really hope that a lot of graphic designers and fashion designers will participate. 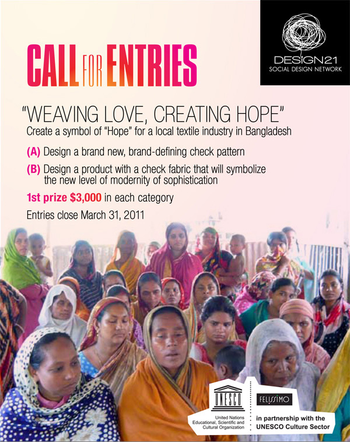 You have a chance to win $3,000.00 as the first prize but more importantly than that you will be supporting a great cause, helping the textile industry in Bangladesh. (It's ironic that I posted a Beatles video "Lucy In The Sky with Diamonds" on facebook today before I found out about this opportunity — you may know that the Beatles were big supporters of Bangladesh) They wrote a song called "Bangladesh" to raise awareness about living conditions there. And there is a documentary about their efforts called "Concert for Bangladesh". Design 21 is an awesome non-profit organization – if you are a finalist your work will be displayed on their site as well. Just click below for details.